It’s been 21 years since the Notorious B.I.G. was shot to death in a drive-by shooting after leaving a party in Los Angeles. But three days before his death in 1997, the rapper, also known as Biggie Smalls, participated in his last photo shoot – which resulted in arguably the most iconic photo of him. A new book titled Contact High: A Visual History of Hip-Hop by Vikki Tobak traces decades worth of rare images and the stories behind them from more than 50 photographers who shared their experiences working with music industry heavy hitters like Kanye West, Jay-Z, Nicki Minaj, Snoop Dog, Tupac, ASAP Rocky, Outkast, Salt-N-Pepa and Nas. Speaking to DailyMail.com, Tobak, who worked in the music industry and as a journalist, explained that the contact sheet showing Biggie during the March 1997 photo shoot is the ‘holy grail of contact sheets’ thanks to the various facial expressions displayed by the late rapper. In the image shot by Barron Claiborne, the Brooklyn-born rapper sported a gold-crown with jewels tilted on top of his head while powerfully staring into the camera’s lens. The photo, which was dubbed the ‘King of New York’, graced the cover of Rolling Stone magazine after his death and is still one of the most recognized images of the late music artist. But during the photo shoot, Claiborne captured more than the King of New York and the contact sheet of images shows an informal story. ‘I had never seen that one image on the contact sheet where he’s smiling and you know laughing,’ Tobak said. ‘And you know, you think about the very stern face crown image that we know and that’s kind of defined his legacy in a way. ‘That is the photo that everyone shows, but when you see the outtake on the contact sheet of the smiling Biggie, people that really knew him always say like that is the Biggie that I knew, like he was always funny, he was always cracking jokes. He was always that dude. Of the day the photo shoot took place, Claiborne explained in Tobak’s book how the rapper arrived at his studio located at 100 Greenwich Street near Wall Street and was accompanied by Sean ‘Diddy’ Combs, rapper Lil’ Cease, stylist Groovey Lew and a couple other people. Claiborne went into the shoot knowing that he wanted to portray Biggie as the King of New York and had already photographed the rapper once prior to this shoot. Tobak noted that Claiborne wanted to portray Biggie as an African king in the shoot because he pictured the rapper ‘as very loyal’ and at the time he was truly the king of New York. Of Salt-N-Pepa, Beckman said: 'They were like sisters; funny, cool girls from Queens wearing big gold earrings and chains with fake Louis Vuitton bags. I did a small shoot with them for a British magazine, and they later introduced me to their manager, Hurby "Luv Bug" Azor, who asked me to shoot the album cover. On the day of the shoot, they came wearing leather baseball jackets created by the one-and-only Dapper Dan ... with kente cloth hats, spandex, and gold dookie-rope chains. They used fashion to express their strength and femininity.' The trio is pictured above in images on a contact sheet from the photo shoot. Tobak explained during the photo shoot there were a few issues with those around Biggie, including Diddy who felt as the crown would make the rapper look ‘like Burger King’ and that ‘he didn’t like the idea at all. But Biggie did and went with it during the shoot. 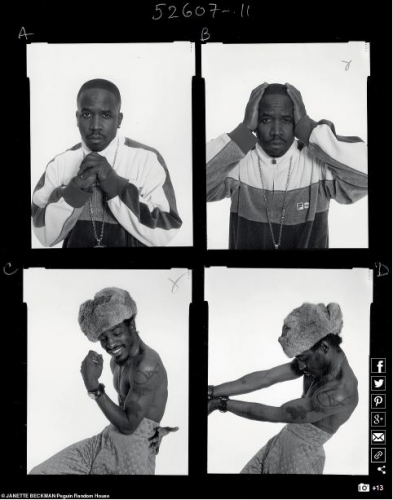 ‘The symbolism of the crown was meant to convey greatness and something bigger about hip-hop and this man had made it to the top of his game,’ Claiborne explained in Tobak’s book. Tobak’s book goes deeper into the telling stories around the iconic photos of hip-hop artists like Biggie from the photographer’s perspective. Photographer Danny Clinch captured images of rapper Kanye West for his album, The College Dropout, which are featured in Tobak's book. Of the Chicago native during the photo shoot at Lt. Joseph P. Kennedy Community Center in Harlem, Clinch said: 'Kanye was someone who clearly had a vision for what he wanted. 'By the time I did the cover of this album, I had already done a lot of classic covers and knew how to respect an artist's vision. Another iconic photo shoot featured in Tobak's book is hip-hop trio Salt-N-Pepa in New York City in 1987. ‘You know by showing the mistakes in the book, like, you know, the contact sheets of like things that were overexposed or underexposed, or like they didn't get the shot right on the first try. And then also showing artists at the beginnings of their career, like really trying to figure themselves out, making mistakes and correcting. ‘I think by showing both things on both the photographers and the artists by showing the mistakes and showing vulnerability, people have really liked and felt like this book is kind of brings everyone together. On November 7, Tobak will participate in a program and book signing at Harlem's Schomburg Center for Research in Black Culture that will feature Sheena Lester, Michael Gonzales, Fab 5 Freddy and Styles P.